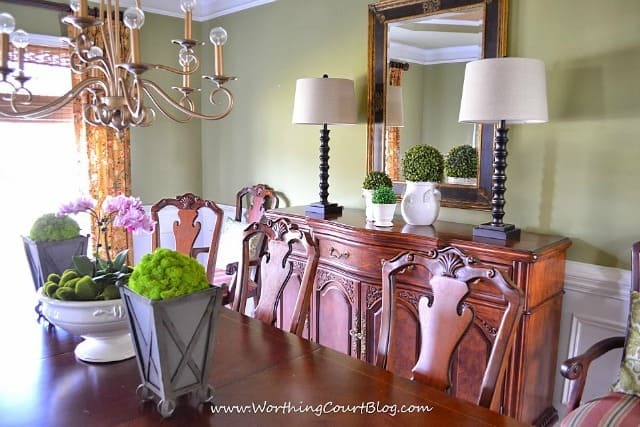 My dining room is proof that spring has arrived at Worthing Court! The calendar may not agree, but my heart says that now that March has arrived, spring must surely be here. Spring is a time for renewal – everything is fresh and green! Nothing complicated, fussy or stodgy will do. 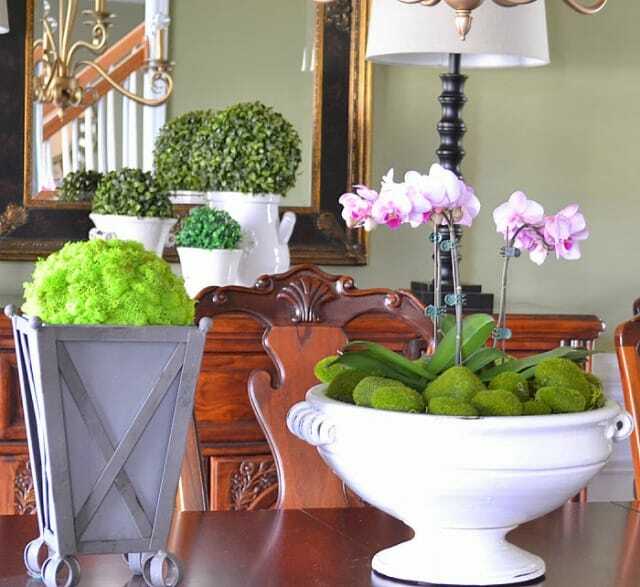 Taking center stage on the table is a large white urn that is filled with grocery store orchids in all their glory. I could get lost in their amazing blooms. Green Spanish moss and faux moss covered rocks create a base that hides the orchid pots. 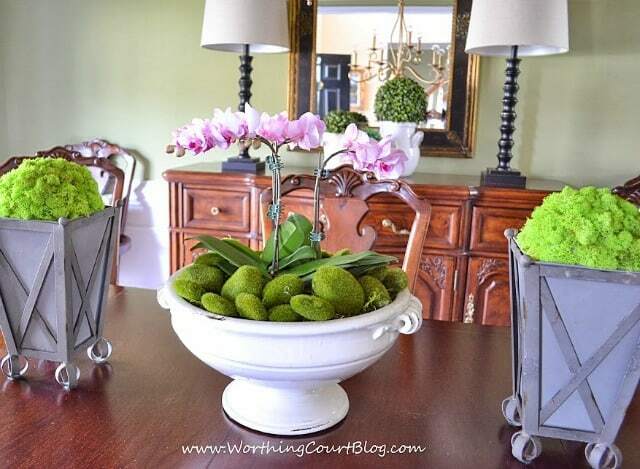 Reindeer moss covered orbs are placed in the zinc planters that flank the orchid filled urn. It is very easy to make your own moss covered orbs. Simply hot glue reindeer moss to styrofoam balls. Reindeer moss is available by the bag at your local craft store. The sideboard holds a very simple arrangement of three various sized white pots. 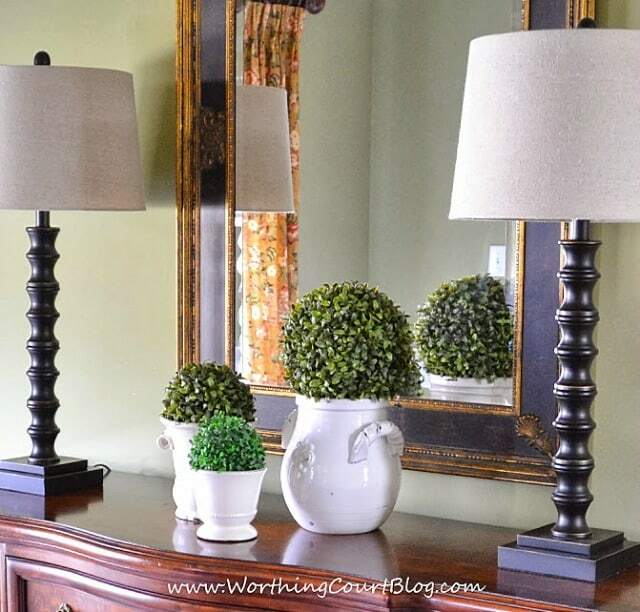 Each one is sporting its own faux greenery orb. Nothing could be easier to put together! 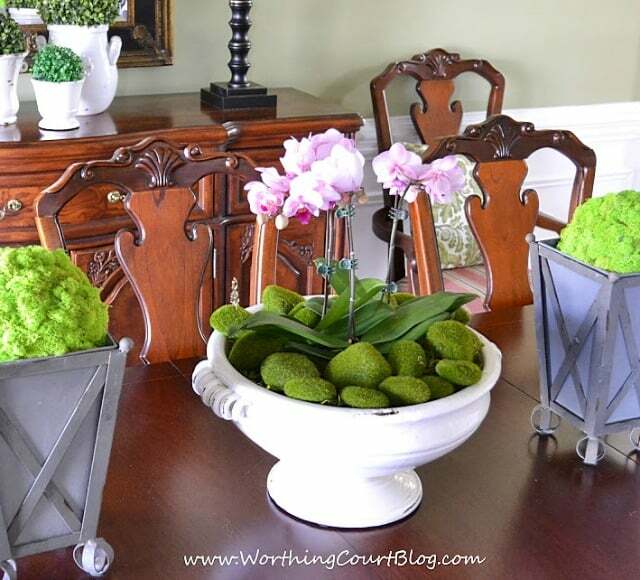 When using lots of greenery – real or faux – in my decor, I like to mix varying shades of green together. It adds interest and keeps things from looking same, same. 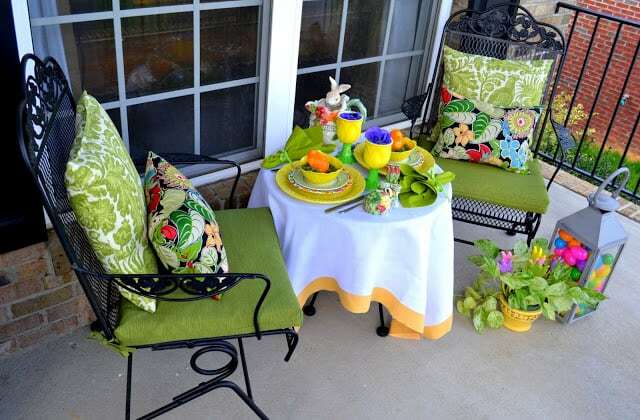 So how about you – has spring arrived at your house? You’ll want to make sure that you come by tonight to link up your best spring project during The Scoop’s Mega Spring Linky Party! Over 30 blogs will be hosting the party. It’s an old fashioned blog hop, so you’ll just link up your spring project once and be seen on each and every blog. Not a blogger? Then you’ll want to stop by just for all of the spring inspiration! 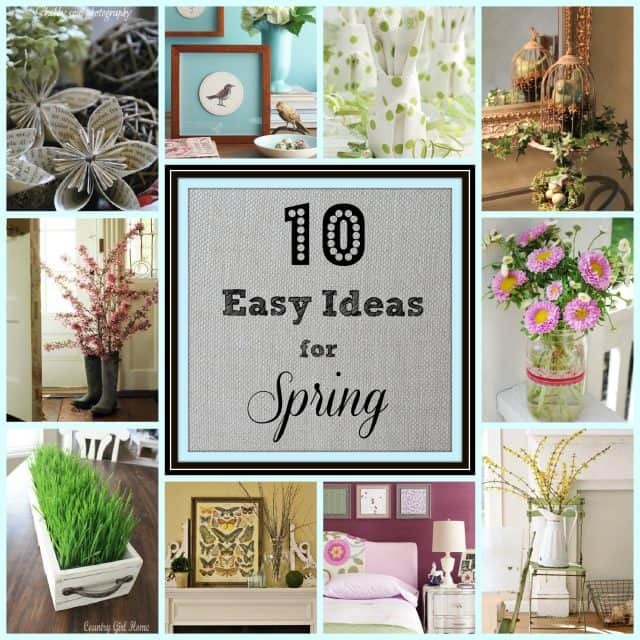 You might be interested in these spring ideas too. Thank you, Penny. Enjoy your orchids! Everything looks so lovely, Suzy! Spring has sprung at your lovely home. Suzy, Everything looks so pretty. I love all your greens and the orchids are absolutely gorgeous. Love the pic across the table looking toward the sideboard. Thank you, sweet Ginger. So wonderful to hear from you. Hope you’ve been doing well in this crazy winter! Of course, I bet it hasn’t been so bad down your way. lol Many hugs to you! 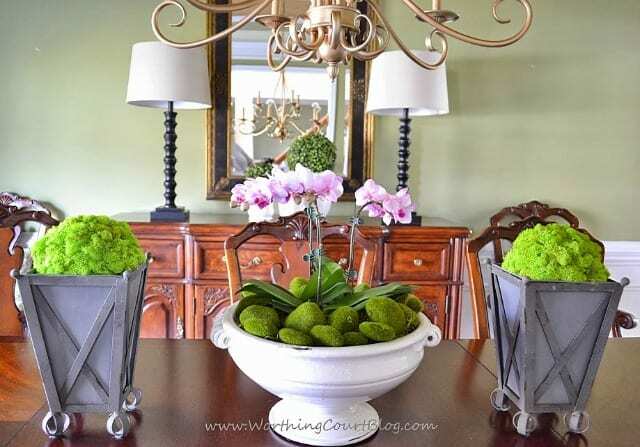 I just created a similar orchid centerpiece! I love the urn you used. I had something similar to use but it wasn’t big enough! I wish spring would arrive already this winter has been brutal! Thank you, Dawn. I’ve been wanting a huge urn like this for a looong time, but never would purchase one until I stumbled across this one for a great price at HomeGoods! 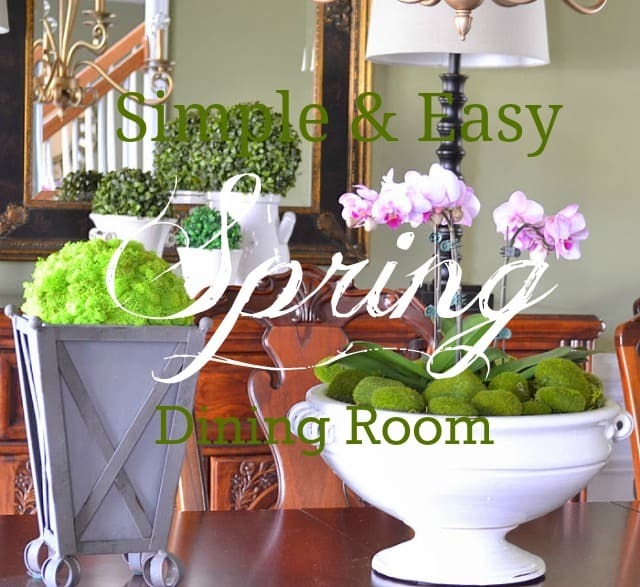 Spring can’t come too soon and it looks like it’s already arrived in your dining room! It’s lovely and I love the fresh colors you used! Thank you, Lynda! I totally agree with you – hurry up spring! So pretty Suzy! I am waiting for the snow to melt and will enjoy your spring table while I freeze!!! Oh it all looks so lovely Suzy! And can I just tell you how much I love seeing your beautiful dining set? I sometimes feel like everyone is painting their darker, traditional dining room furniture and I just still love mine so much the way it is which is very similar to yours. It’s refreshing to know that I’m not the only one and your entire space is gorgeous! 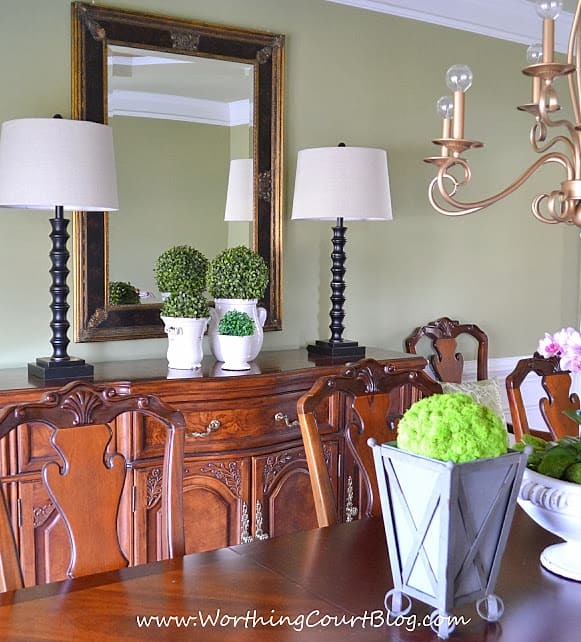 I hope you come by and see my EARLY Spring green inspirations. Have a great week, Suzy! Visiting from Inspire Me Tuesday — have a great day! I actually saw moss covered rocks at Michael’s just yesterday, thought they were interesting, but didn’t know how to use them. Voila!!!!!! 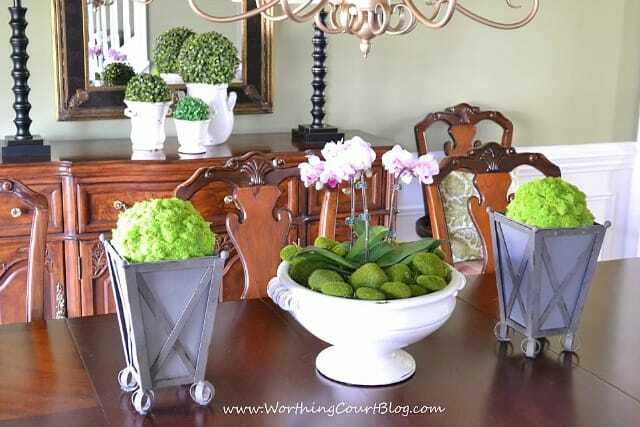 Love how you used them with the orchids, which I am addicted to!!!!! Back to Michael’s!!! !